U.S. Sen. John McCain, center, arrives for a press conference at the Resolute Support headquarters in Kabul, Afghanistan, July 4, 2017. A group of influential U.S. senators has cautioned President Donald Trump that a military surge alone will not help win the war in Afghanistan, and they view as “very unnerving” a lack of U.S. diplomatic focus on the issue. The five-member bipartisan congressional delegation, led by Republican Senator John McCain of Arizona, made the observation Tuesday during a trip to Kabul as the Trump administration prepares to unveil a plan this month to try to defeat the resurgent Taliban. The proposed strategy is expected to add several thousand more U.S. troops to about 8,600 already deployed to Afghanistan to help struggling Afghan security forces fight the insurgency. “We need to have a strategy to win. The strongest nation on Earth should be able to win this conflict, and we are developing the strategy to do that. And we are frustrated that strategy had not been articulated yet, to be honest with you,” McCain told reporters after talks with Afghan leaders. U.S. Senator John McCain, center, speaks during a press conference at the Resolute Support headquarters in Kabul, Afghanistan, July 4, 2017. 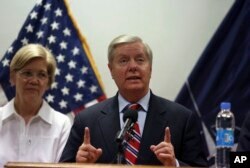 Senators Elizabeth Warren, left, and Lindsey Graham are seen in the background. He says that the current security situation in Afghanistan is a matter of concern for his delegation. “Each of us may describe that concern in our own way, but none of us would say that we are on a course for success here in Afghanistan,” McCain said. Another member of the delegation, Republican Senator Lindsey Graham of South Carolina, urged Secretary of State Rex Tillerson to visit Afghanistan as soon as possible to directly involve himself in terms of filling the vacant embassy posts, as well as State Department vacancies, to be able to deal with the civilian diplomatic challenge facing the U.S. mission. “You are not going to win this war just though more bombing ... and we don't have the focus we need to make sure that whatever military surge we engage in is accompanied by a diplomatic surge. 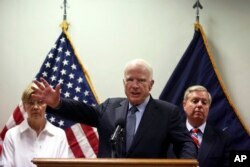 ... And on the secretary of state side, I see a lack of focus that is very unnerving,” Graham said. U.S. Senator Lindsey Graham right, speaks during a press conference at the Resolute Support headquarters in Kabul, Afghanistan, July 4, 2017. Senator Elizabeth Warren is shown at left. Senator Sheldon Whitehouse, a Democrat from Rhode Island, also underscored the need for pushing diplomatic efforts that run parallel to the possible military surge in Afghanistan. “I hope very much that the strong bipartisan message from this delegation, that at least as to south-central Asia, is these important positions need to be filled. They need to be filled with capable experienced people and they need to be empowered to make the decisions that will drive success,” said Whitehouse. McCain said that in his assessment, getting major areas of the country under government control, keeping the Taliban from urban centers and working toward a cease-fire with the insurgents would be like winning the war. “It will probably be a simmering crisis for many years to come. … They are not going to negotiate unless they think they are losing. … So, we need to win and have the advantage on the battlefield and then enter into serious negotiations to resolve the conflict,” he said. The Senate delegation, which included Democrat Elizabeth Warren from Massachusetts and Georgia Republican David Perdue, visited Kabul at a time when the national unity government of beleaguered President Ashraf Ghani is under growing pressure to quit over a lack of key political and security reforms. New anti-government political alliances have emerged, involving some of Ghani's governing partners. The security situation across Afghanistan also has rapidly deteriorated, with Taliban insurgents making more territorial gains, launching major attacks on key cities and inflicting heavy casualties on government forces. Officials say intense fighting has been raging in 21 of the 34 Afghan provinces. Acting Defense Minister Major General Tariq Shah Bahrami told reporters on Tuesday that the Taliban — with the help of “foreign fighters” — was preparing to conduct a major assault against the strategically important northern city of Kunduz, which fell to the insurgents twice within a year.